Customer Interaction Processes Have Evolved. Your Call Center Should Too. 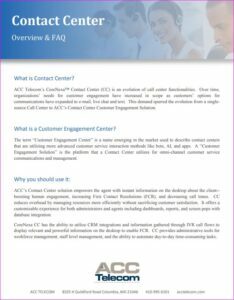 ACC Telecom’s Contact Center software Baltimore, MD solution is an evolution of call center functionalities. Over time, organizations’ needs for customer engagement have increased in scope as customers’ options for communications have expanded to e-mail, live chat, and text. 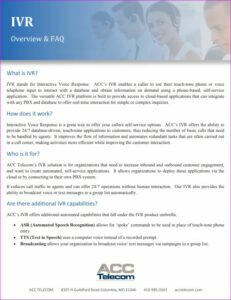 This demand spurred the evolution from a single-source call center to our Contact Center solutions. 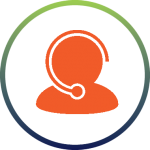 requests, and optimize Contact Center operations. Our Contact Center software Baltimore, MD solution includes iOS and Android mobile functionality so supervisors will have the same functionality on tablets that they do on computers. Supervisors and managers can roam the floor, monitoring activity in real time while they’re away from their desks. 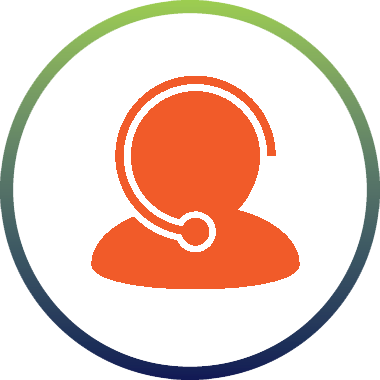 We understand that no two businesses are alike, therefore we offer simplistic Call Center software to multimedia, advanced Contact Center software and everything in between. Contact us today to learn more about customizing a Call Center or Contact Center solution for your unique business. expect businesses to deploy multimedia interaction experiences that include voice, web chat, email, SMS text, CBIQ, CRM, AI, and more. Contact Center tools help reduce Call Center operation costs and hold times significantly while increasing customer satisfaction. Whether you have five employees or thousands, our cloud based Contact Center software with IVR and Automatic Call Distribution (ACD) capabilities will help serve customers quickly, efficiently, and cost-effectively, providing a competitive advantage to businesses of any size. will help you identify and select the right Contact Center support system for your needs and our highly-skilled technicians will handle the installation, training and on-going support for your Contact Center or Call Center Software, Voice Recording System, Interactive Voice Response (IVR), and Automatic Call Distribution (ACD) solution. Contact us for more information on our call center software solutions. We look forward to hearing from you! Contact us today to learn how you can transform your business and your customers’ experience by implementing an affordable Contact Center or Call Center software solution.